In an effort to help others in my life live within their family grocery budget I have been putting together these different meal ideas. If you are unfamiliar with the process of this please got back to this post, so that you will have all of the groceries you need to get started. Ok. So we have purchased our groceries for the week and we are going to do our best to have them go as far as possibly without feeling hungry by 8pm. Note what your eating habits are so that you can adjust snacks and meals according to your preferences. Tonight’s dinner is an easy start with much left to be used again. We will cut down on your cooking time a bit by doubling a few things so we can use the second half again later. 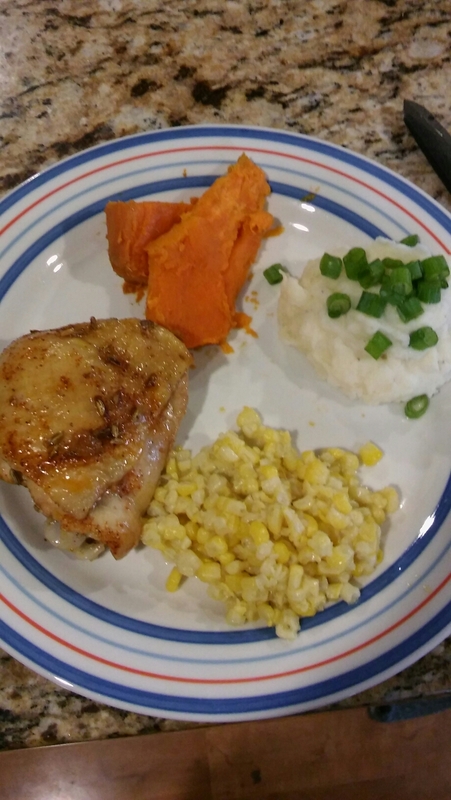 Tonight we are having mashed potatoes, corn and baked chicken thighs (you could grill these too if you wanted). Using half of the chicken thighs, take your chicken thighs and sprinkle with salt and pepper, a bit of seasoned salt and drizzle a bit of olive oil on top. I also add a few thin slices of onion and a bit of fennel seed. 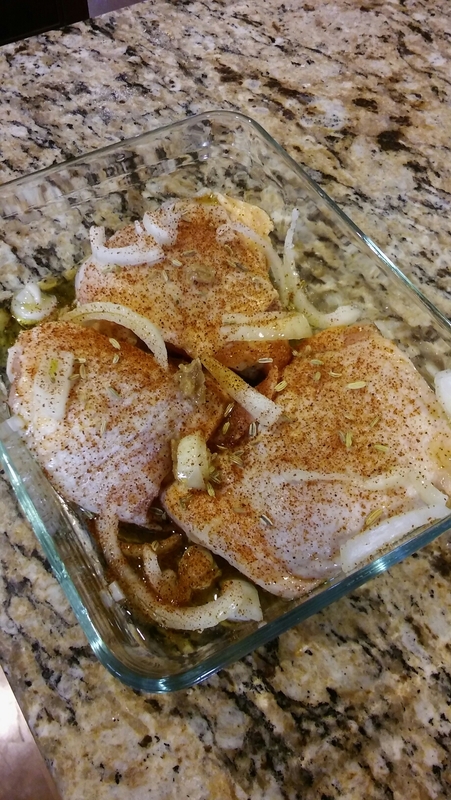 Chicken with seasonings, fennel seed, onion and Olive oil. Cover with aluminum foil and bake at 350 degrees for about an hour or until done. You will probably end up with some chicken thighs cooked but not eaten. That is the plan! You will let those cool and after your meal we will prepare them for another meal. While the chicken is cooking, start peeling and quartering about a pound and a half of potatoes. I say a pound and a half but determine what would be the DOUBLE of what you would normally prepare. Half of these potatoes will be used tonight and the other half will be saved for another night this week. Boil the potatoes until fork tender, drain, mash, add a few tablespoons of butter, salt and pepper, and a bit of milk. Although I’m a heavy whipping cream girl…not so healthy but so good. Done! Warm the corn any way you choose and enjoy tonight’s meal. Be sure to eat your fill of this tasty meal. We had some extra sweet potatoes and green onion to use up. The potatoes and extra chicken will be used in the coming days but you need to prepare them now to save a bit of time and dirty dishes later. It’s very easy to do and won’t take much time at all. Veggies are the simplest; simply store them in a container in the fridge. Corn and potatoes will be used again later. Done! For the chicken, take any thighs that are uneaten and strip the meat off of them. Shred it up into small pieces so that it would be about the size you find in a typical hot dish. Store this too in the refrigerator, maybe even right by the potatoes so they are both easy to find. Cost for this meal is about $1.12 per person. This is based on an individual eating one chicken thigh, half a cup of corn and half a cup of potatoes. Prices may vary based on location of products.